They had these available in a home furnishing show/event not too long back. It was definitely a clever and comfy sofa, however, it did require quite a bit of muscle to raise into a bunk bed. Also, I imagine they are pretty expensive to ship to the U.S. 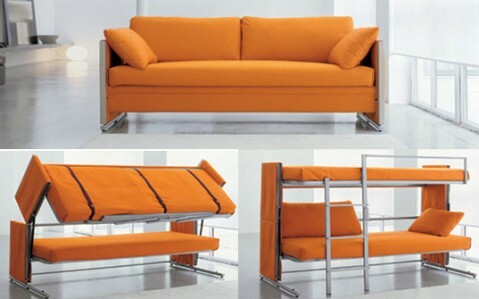 When I came across with your blog I really came to know that how DOC sofa/bunk bed is good. I would really like to have this bed for kids. Might be it is expensive but priceless for the kids. A comfortable bed for the kids. The perfect bed for the kids and guests. A bunk bed is a type of bed in which one bed frame is stacked on top of another.This leads to them being used in places with limited floor space such as kid’s room, hostels, ships and university residential area. This beds comes many types such as standard bunk bed, twin over full, futon bunk, L-shape,loft bed. If you really wanted to save the space of your kid’s room then this bed should be your first choice. This is nice sofa! The color are so sweet. I think it is comfortable to all the people who is sick to the sofa. Sofa is popular these days. Because they just taking relax. The bed sofa is good to kids. They are very happy to sleep. Nice! I haven’t seen one like this. I got a great deal on bunk beds at this site. Check them out they have some sweet deals.